The delicious, sour and refreshing drink is prepared by the so-called mushroom kefir. Experience has shown that it is good for the health, cures and helps in treating many diseases and discomforts. Kefir is a probiotic dairy product, which was known to the inhabitants of the Caucasus in ancient times. According to tradition the grains and the instructions for its preparation were received directly from Prophet Muhammad, along with a commandment to keep the secret. It is considered as an elixir of youth, life and longevity. With kefir you cannot add pounds. In 100 grams of kefir it has 64 calories with 3.4 grams of fat (which is the same as in yogurt) and has a strong capacity to improve the digestive system. It is used by people who have upset digestive system, but also is used by those who have problems with the bones, because the bacteria that can be found in the kefir, can help in their strengthening. Also, there is a so-called water kefir, known as Japanese crystal. It is a kind of kefir fungus. 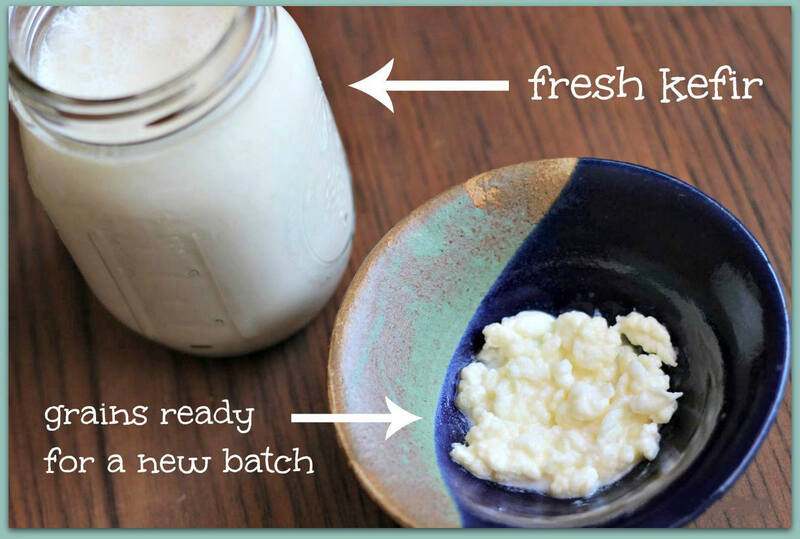 Has similar properties as kombucha, but is much simpler to maintain (something like milk kefir). It helps to normalize the blood pressure, cholesterol, blood sugar levels, increases immunity and reduces the risk of cancer. Also it contains many probiotics or so-called good bacteria`s that are essential for the digestive tract such as: Lactobacillus caucasus, Leuconostoc, Streptococcus, Acetobacter. Also in the intestines are a lot of nerve cells (100 million), which is approximately equal to the number of brain cells, so in the intestine is excreted 95% of the important neurotransmitter – serotonin. It is important to note that the industrial manufactured is not produced by using the “mushroom of kefir”, it is prepared with hops and bacteria cultures that give the drink the same flavor, but not same quality. It is best to prepare at home. The method of preparation is very simple. It only needs milk and mushrooms or grains of kefir. Traditionally, metal bowls and spoons are not used for preparation of kefir, because the medicinal effect of the drink can be lost. 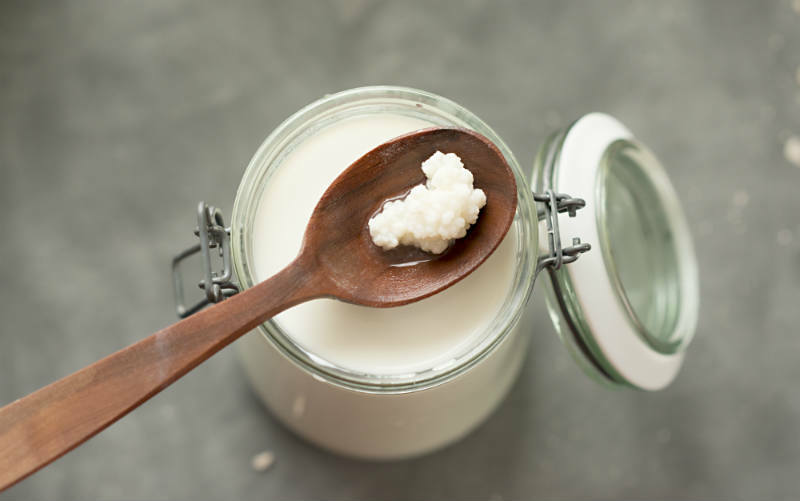 It takes two tablespoons of cells and any milk (cow, sheep and goat) for half a liter of kefir. Milk can be boiled or not, but it must be hot. It is recommended that the milk contains not less than 2.8% fat – how much more fat the milk contains, the kefir is better. The milk should be placed in a glass or plastic container and along with the grains. Should be covered with lid and left at room temperature for 24 hours. The temperature in the room should not exceed 30 degrees Celsius. Within 24 hours the liquid will thicken. Occasionally, it should be mixed to check the thickness of the liquid. After that the liquid should be drained (it is recommended to use plastic droppers), bottled and store in refrigerator. Kefir mushroom should be washed with cold or lukewarm water and to be left in the refrigerator day or two in cold water or milk. Grains of kefir will multiply very quickly and that will allow obtaining large quantities of the drink. The amount of milk for preparation of kefir increases in proportion with the amount of grains. This probiotic is consumed in order to maintain health and vitality. Therefore it can be consumed daily. It is recommended to start with 1 dcl and gradually increase the amount. For therapeutic purposes it should be consumed 1 liter of kefir a day. Please where can I buy kefir ? To use for the cure of candida yeast . You can buy organic kefir grains online (www.amazon.com) and prepare kefir milk by using the recipe from the article. You mention room temperature but say it should not be more than 30 degrees. Are you talking F or C degrees? If F, that would be about the temp of a refrigerator. If you are talking C, what would that be in F degrees? The temperature in the room should not exceed 30 degrees Celsius. That is 86 degrees Fahrenheit. Thank you for informations..but in all web sites its written that we should use cold milk…for me my mushrooms of kefi are in good health but each time when I make them in cold milk after one day the milk become some thik and mushrooms are on the top of buttle!!?? Is that normal? And what should I make if I waint to conserve a quantity in the fridge? ! Thank you very much for giving attention.